Readers of this blog will no doubt be aware that Paul Ryan, who had illustrated the daily episodes of “The Phantom” newspaper comic strip since 2005, died unexpectedly at his home on March 7. 2016. His untimely death was reported by several comics and entertainment websites, such as Newsarama and Bleeding Cool News, and King Features Syndicate published an obituary on its website. While Ryan was arguably best-known to American comic-book readers for his work on The Fantastic Four for Marvel Comics (US), he was better known outside America for his work on “The Phantom” newspaper strip. 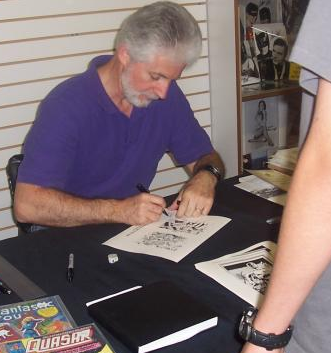 However, Ryan’s first involvement with the character occurred several years before he took over as artist on the daily newspaper strip for King Features Syndicate. He drew his first Phantom story, titled “The Invisible Phantom” (written by Ben Raab), which was published in the Swedish Fantomen comic magazine, back in November 2001. He succeeded George Olesen and Keith Williams as resident illustrator for the daily episodes of “The Phantom” comic strip in 2005, and subsequently illustrated the Sunday/weekend episode of “The Phantom” comic strip from 2007 to 2012 (For a complete listing of Ryan’s daily & Sunday episodes of “The Phantom”, click here). Ryan, through working in collaboration with author Tony De Paul (who has written “The Phantom” comic strip since 1999), has helped reinvigorate The Phantom comic strip, thanks to his bold and forceful artwork, complemented by De Paul’s complex and compelling stories. As of this writing, there has been no indication as to when Ryan’s last completed episodes of “The Phantom” comic strip will see print, or who will succeed him on this long-running series.